The 9th head of the Kobikicho Kano School in Edo. Osanubu was born in 1796 as the eldest son of Kano Isenin Naganobu. In 1819, Osanubu was ordained as Hogen rank. In 1828, he scceeded the family head of the Edo Kobikicho Kano School as his father died. Osanubu is regarded as the last giant of the Kano schools painters in the Edo period (1603-1868). He also trained up Kano Hogai and Hashimoto Gaho. 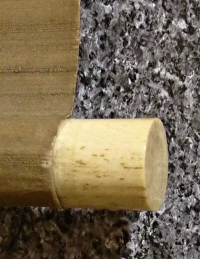 There are a few strong folds, some grazes and stains on the mounting part. And also there are some faint spots on the drawing part. Although, Mt. Fuji is painted artistically and figuratively in the Japanese traditional painting style. 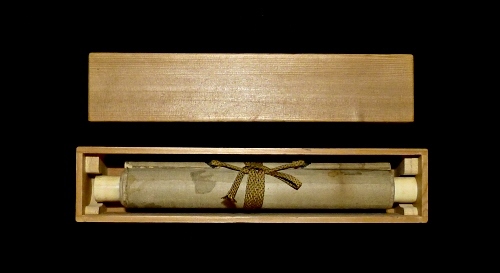 This is Chagake type hanging scroll which is usually hung on at a Tokonoma area in Japanese room for Chanoyu Japanese tea ceremony. Of course, it is also good to hang it on a wall of any ordinary room. So, we cannnot guarantee that it is authentic one.